Emotions are amazing and colorful. 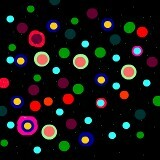 Poka dots are everywhere.These are different colors that show peoples emotions and feelings! Tags : so many colors! I love this good job. It is very colourful. IT"S BEAUTIFUL!! !